I have a new respect for penguins. As one of the veterinarians at the Detroit Zoo, I know a lot about these aquatic birds – how to collect blood from a penguin, how to anesthetize a penguin, what types of medications I can give to a penguin, and how the inside of a penguin should look on a radiograph (X-ray image). In fact, the day before I left for an expedition to Antarctica, my veterinary ophthalmology colleagues and I restored vision to two of our rockhopper penguins by performing surgery to remove their cataracts. However, after visiting these amazing little birds on their home turf and seeing how they live their daily lives, I realize that I had no idea how a penguin actually “works”. Antarctic penguins live incredibly harsh lives, but they make it look simple. They appear to be perfectly at home in 29°F salt water. That is not a misprint. The salt causes the water to freeze at a lower temperature than fresh water, so they actually swim daily in water than would be frozen if it were in the Great Lakes. We saw penguins everywhere in the water, swimming like bullets and porpoising with ease at high speeds. Penguins, in fact, live most of their lives at sea. 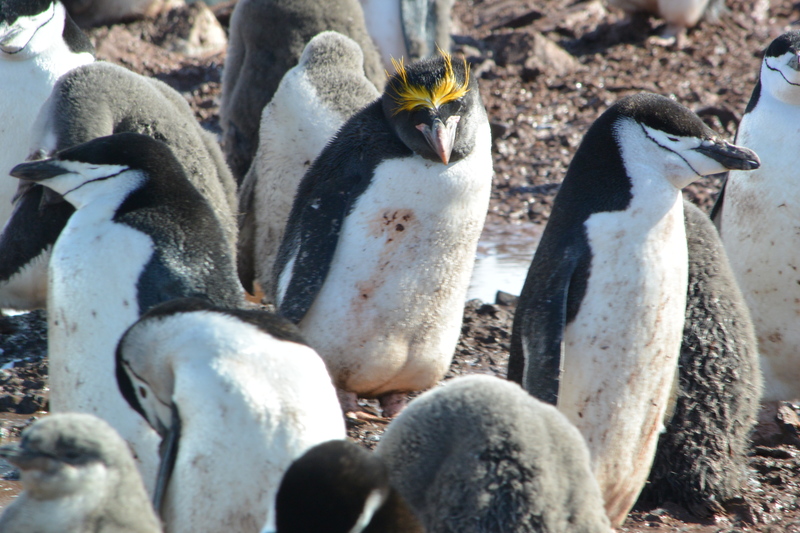 Their only use for land is during a relatively brief nesting, breeding and molting season. 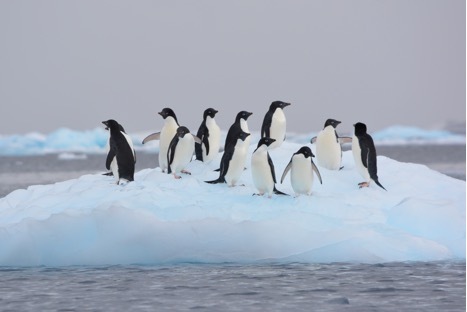 Our visit to Antarctica took place during the austral summer and, at this time, the penguins are on land for breeding. Although their stout little bodies and short legs are much more suited to swimming, they manage to navigate rocks of all shapes and sizes, sometimes climbing steep and treacherous cliffs to get to their chicks. 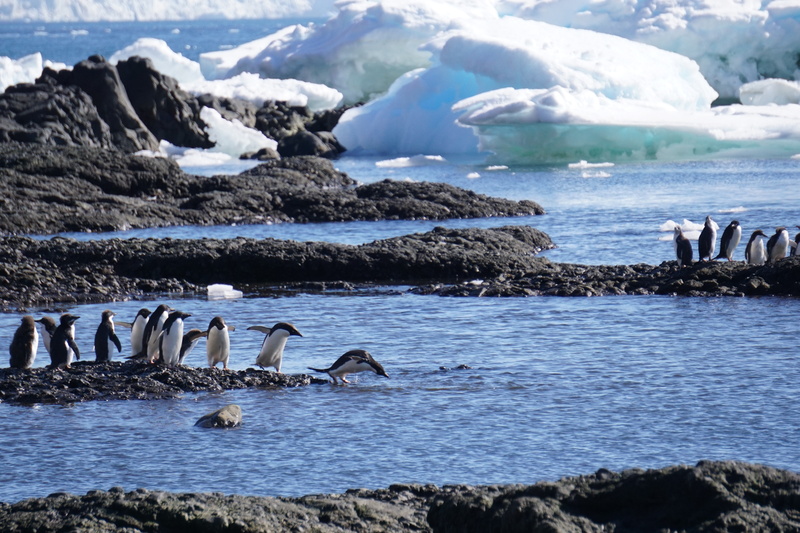 Aside from a few relatively flat beaches, we rarely saw penguins walking on level surfaces. They do fall occasionally, sometime frequently, but they get up every time and continue on their mission. Late in the breeding season – when we arrived – penguin parents spend hours hunting for food in the water and then return to feed their chicks, who are at this point nearly the same size as their parents. 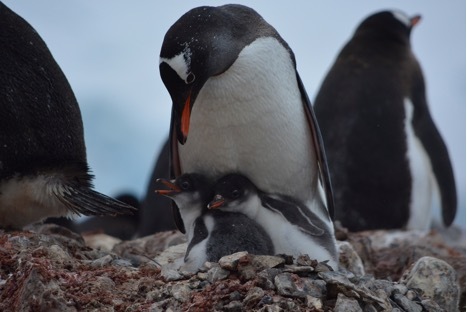 After the parents have hunted all day – making difficult and treacherous climbs up the rocks – their large, pudgy chicks seem much more greedy than grateful for all of the parents’ hard work and dedication. 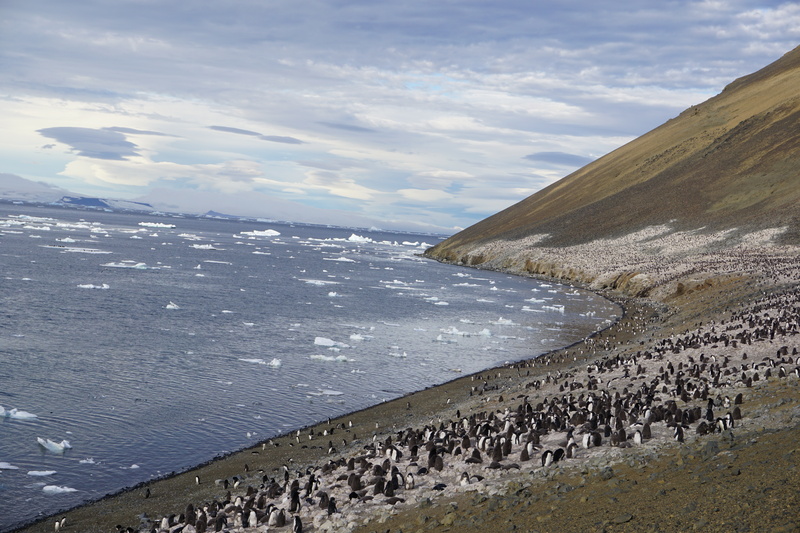 After feeding all that they have to their chicks, the adults head directly back down the treacherous rocky cliffs and back into sub-freezing cold water to start over again. These amazing birds live such a hard life, and they make it make it look easy. Or maybe not easy, but they manage it. Because it’s what they do. It’s how they “work”. Now that I’m back at the Zoo working with our penguins, I have so much more awe and respect for these amazing creatures, and I feel so fortunate to have had the opportunity to witness the workings of wild penguins firsthand. In what seems like the blink of an eye, this incredible journey at the bottom of the Earth has come to an end as I write to you back home at the Detroit Zoo. 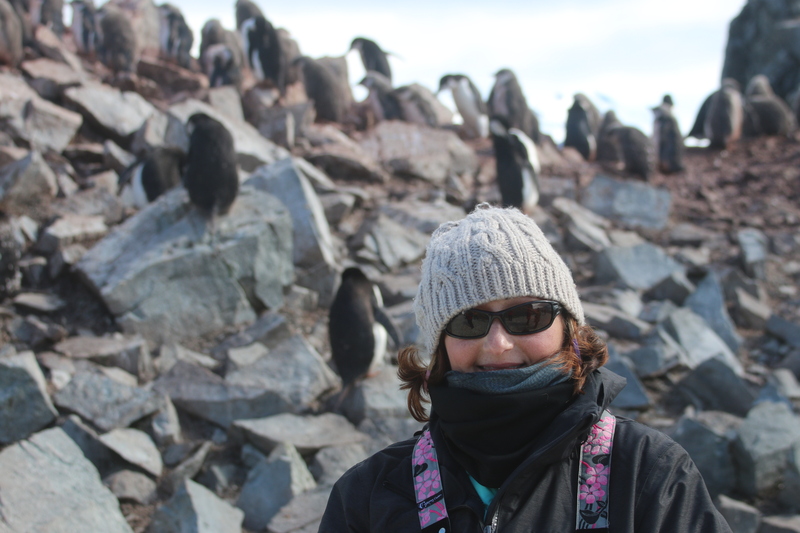 Three months ago, I flew to Chile, sailed across the Drake Passage and landed on Anvers Island in Antarctica. My home became the U. S. Palmer Station where I joined the expert field team of Polar Oceans Research Group. 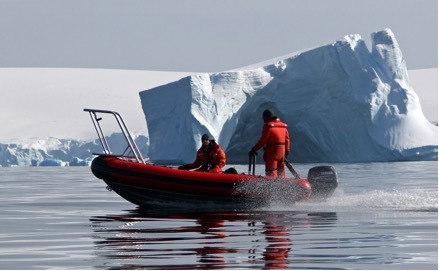 We zodiac’ed around the local waters through wind, snow, and ice day after day, traversing the stunning landscape to study penguins, skuas, southern giant petrels, and more. Through the quick Antarctic summer, we travelled to many rocky islands, watching the birds lay eggs and diligently incubate them to hatching. 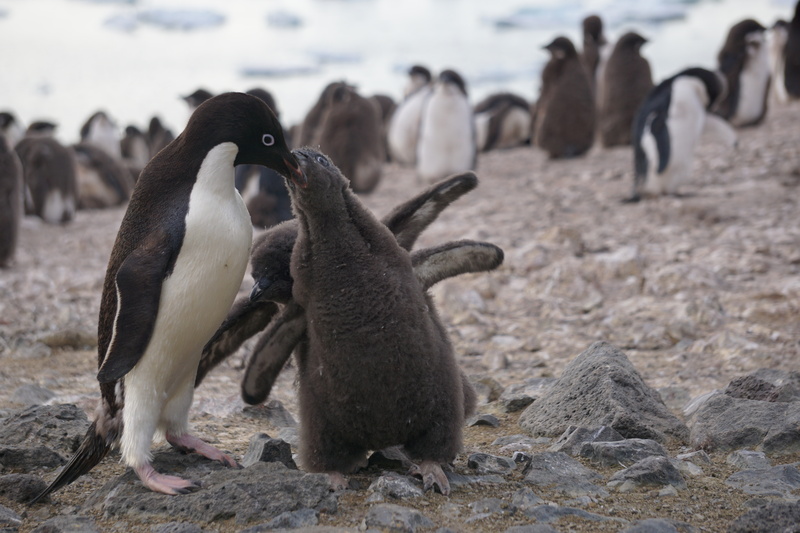 Then the dedicated parents brooded their chicks, foraging often to find krill, fish, and more to feed their downy kin in an effort to raise them to maturity. In my final days of observation, the birds continued to grow. 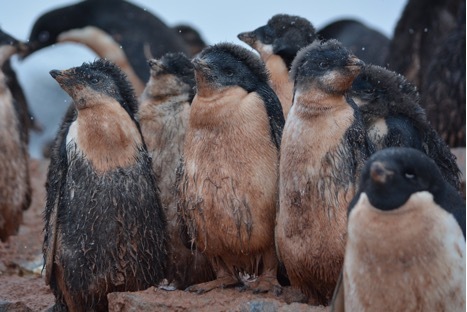 The Adelie chicks lost most if not all of their down and are were almost ready to hop in the Southern Ocean for their first swim. The chinstraps were just behind them, but the gentoos were still downy, with a little more time to grow before hitting the chilly waters. The brown skua chicks were running all over the place as their primary flight feathers were quickly developing. The southern giant petrel parents were regularly leaving their chicks alone at the nest while they went out in search of food. As we studied the birds, we had to watch out for the many fur seals that had joined the neighborhood, as they do around this time every year. We also saw a couple more humpback whales in the area. 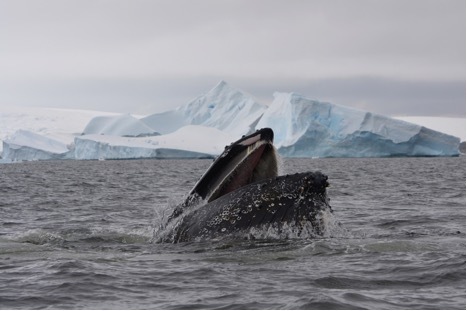 One playful individual made quite a commotion on the surface and was repeatedly lunge-feeding, devouring lots of krill. Antarctica is now a part of me, and a very special part of our world. 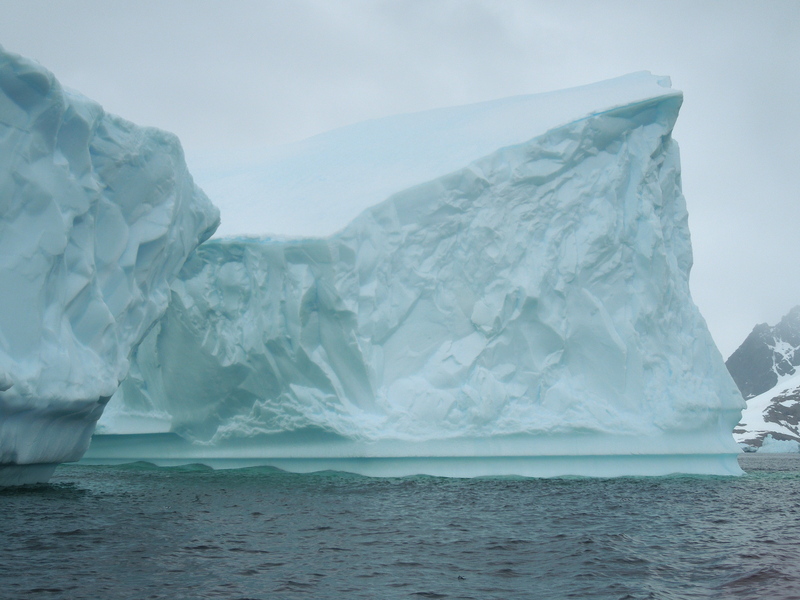 The Antarctic peninsula is one of the fastest changing places as the world’s environment changes. It will take a worldwide effort to help our planet, but every conscious decision you make to respect, recycle, and conserve will help turn the tides. I am so proud to be a part of our Detroit Zoological Society. Please walk with us down the path of sustainability. Thank you for reading and joining me on this extraordinary journey. – Matthew Porter is a bird department zookeeper for the Detroit Zoological Society who spent the last few months at the U.S. Palmer Station in Antarctica for a rare and extraordinary scientific opportunity to assist a field team with penguin research. February is the perfect month to share one of our favorite children’s books: “My Heart is Like a Zoo”, by Michael Hall. 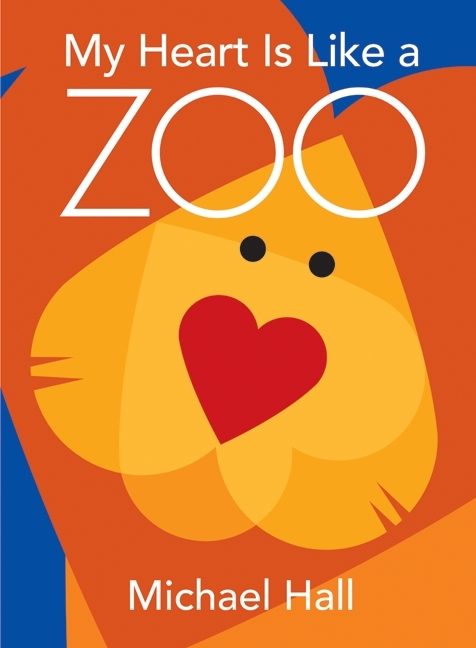 This book is cleverly illustrated with colorful animals that are composed of heart shapes, and we’ve used it to facilitate a variety of activities through the Detroit Zoological Society’s education department. Most recently, our team prototyped an activity based on the book’s illustrations to use in our monthly programming at local pediatric hospitals. Staff or volunteers will read the book and talk about the animals, shapes and colors, depending on the age of the audience. After reading the book, the children are provided heart shapes made from construction paper. They are various sizes, colors and configurations. 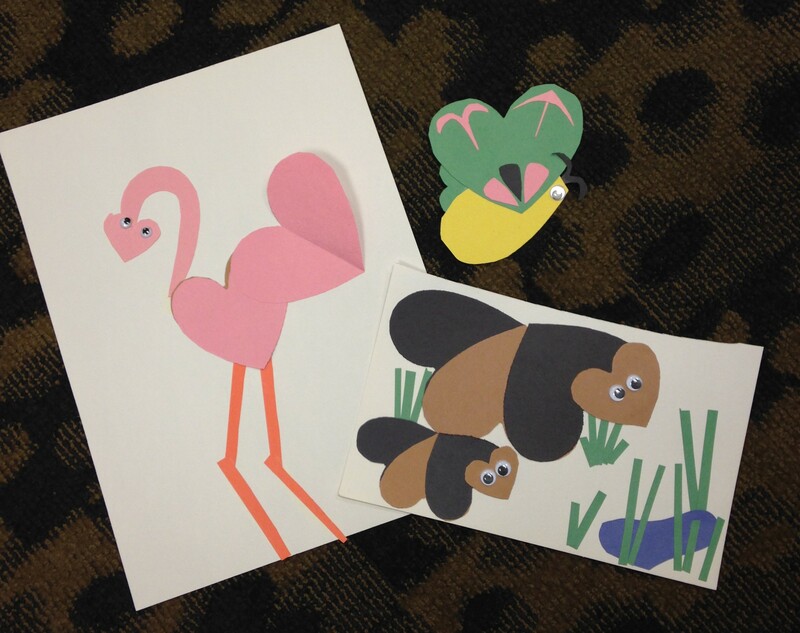 The children can use the hearts we provide or create their own as they construct animals out of the shapes. The activity builds spatial relations, pattern building, color blending and fine motor skills. The young men at Children’s Village, a juvenile detention facility we work with year-round, use the book as inspiration as they create Valentine’s Day cards for children at local pediatric hospitals. 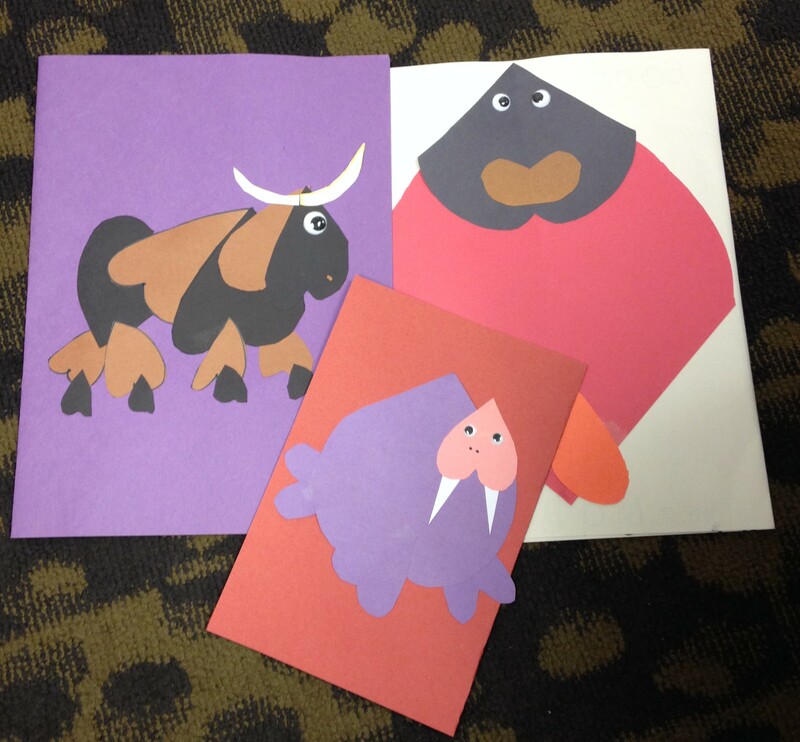 We bring a variety of paper with us and the boys create animals out of the heart shapes for the front of the card. On the inside they write thoughtful messages for the recipients. Providing opportunities for these young men to think about other people in a compassionate way and make a positive impact through something they’ve created leaves a lasting impression on them. “My Heart is Like a Zoo” is available at most area libraries to borrow or at local bookstores if you’d like to bring it home forever. We hope you enjoy it as much as we do! Greetings from Anvers Island! 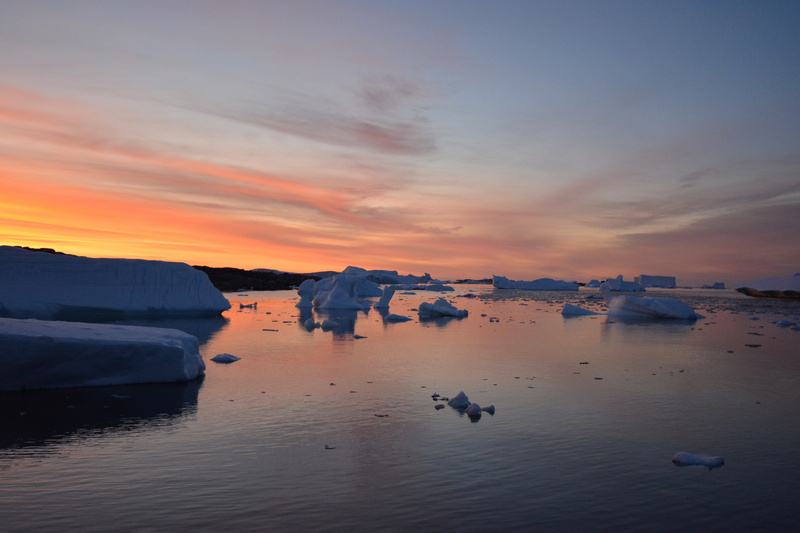 The front of the U.S. Palmer Station doesn’t usually have many icebergs, but this summer, the waters around the station have become something of an iceberg parking lot. The last few days have been breezy with a couple inches of summer snow, but that has not stopped us from making our rounds. Throughout the area, the seabirds are busy raising demanding chicks while humpback whales are swimming by. The south polar skuas are just starting to hatch and we are seeing their chicks on a couple of the islands. The brown skua chicks have grown significantly. Their primary flight feathers are starting to come in and they are becoming more challenging to measure. The sneaky youngsters are often hiding behind rocks away from the nest. They are quick on their feet and run from us when we approach. The ages of the southern giant petrel chicks vary with some newly hatched and others barely fitting under their brooding parent because they’ve grown so much. Often as we walk by, we’ll see a fuzzy white head sticking out under mom or dad. 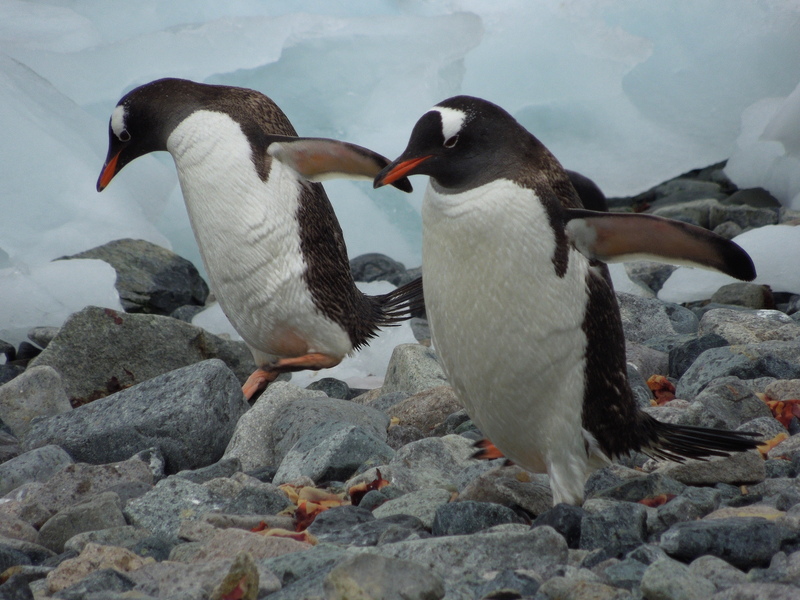 All of the penguin chicks are growing rapidly but the gentoo chicks are the smallest, with many still fairly young. These chicks are very cute; their beaks already show orange and somehow the young birds manage to stay very clean. 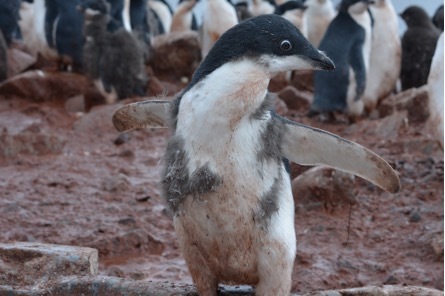 The chinstrap chicks are also tidy-looking and have grown significantly. 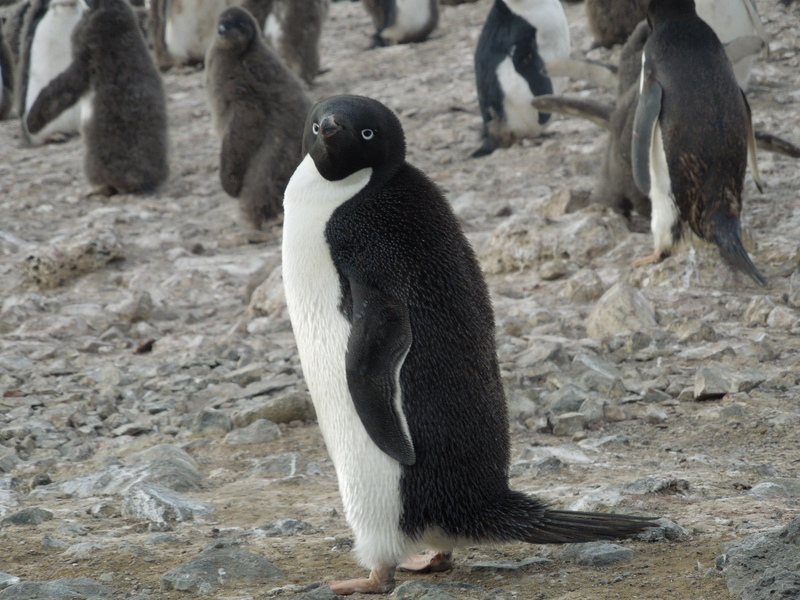 The Adelie colonies are thinning out as the parents are spending more time out foraging. Their extremely messy chicks are forming groups called crèches. At this stage, the young birds are really starting to grow up and are willing to venture away from their nest to hang out with other chicks. The oldest chicks are in the process of molting their down and many look quite funny. They are partially covered in down with some of their first molt showing. 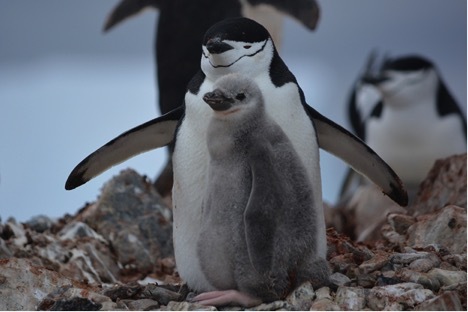 This next generation of penguins is developing quickly, which is important as the quick Antarctic summer is flying by. As I reflect on this wonderful journey, I continue to marvel at the purity of Antarctica’s environment. Please try your best to respect the environment wherever you are and leave behind the smallest footprint you can. We share an incredibly beautiful world and it’s all of our responsibility to protect it. 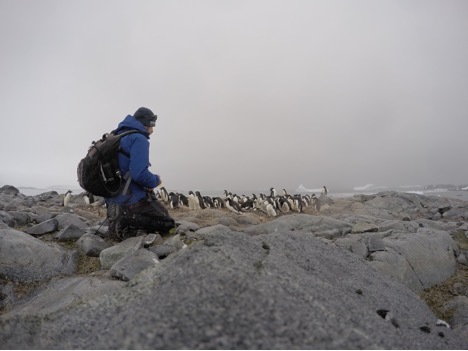 – Matthew Porter is a bird department zookeeper for the Detroit Zoological Society and has spent the last few months at the U.S. Palmer Station in Antarctica for a rare and extraordinary scientific opportunity to assist a field team with penguin research. 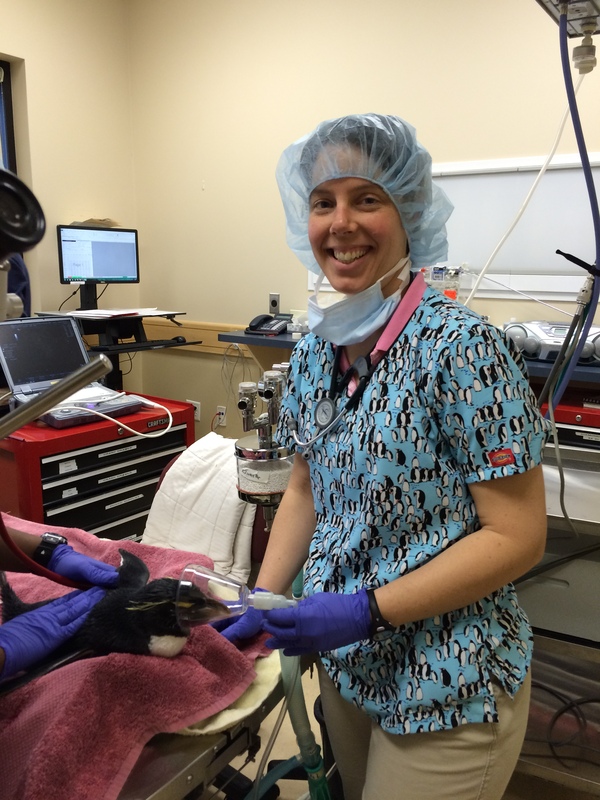 Dentistry is a very important component of veterinary care for the animals at the Detroit Zoo. Many of the animals here live longer than their wild counterparts, so ensuring that they have healthy teeth throughout their lifetime is a priority. Dental issues can have a big impact on comfort and the overall well-being of an animal. We sometimes find that if an animal is showing a decrease in appetite or is experiencing weight loss or other problems, they ultimately have underlying dental problems. Whenever we do an exam on an animal, we are sure to carefully examine the teeth for problems and to scale and polish them to remove tartar or plaque. If we see problems or areas of concern, we take skull or dental radiographs to look for problems under the gum line, just like you experience during your routine dental visits. Recently, one of our zookeepers noticed that a red panda was not opening his mouth fully when taking in food items such as grapes. We examined him under anesthesia three times over a short period, and despite anticipating a dental issue, we were unable to find any areas of concern during examination and radiographs. We collected diagnostic samples and treated him with antibiotics and anti-inflammatory and pain medications. Each time, the problem improved and then recurred. 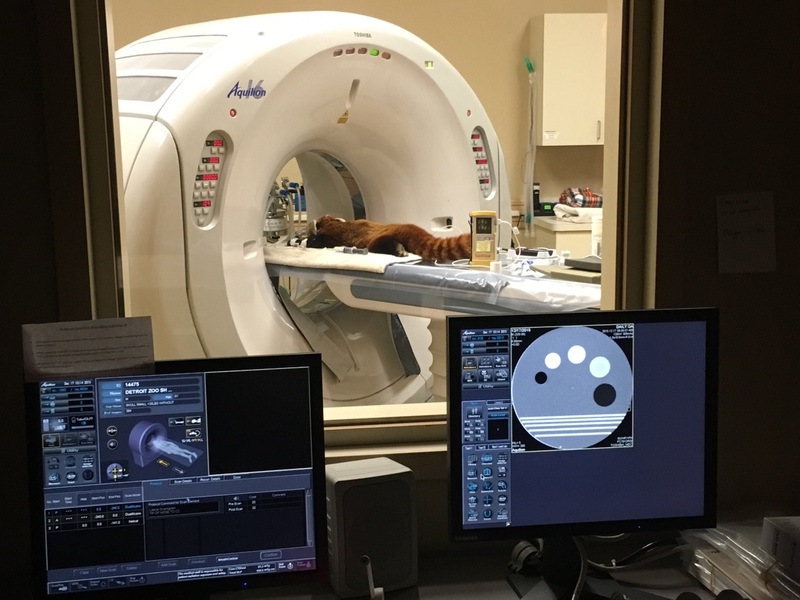 When the red panda started having problems most recently, we decided to transport him to a nearby veterinary specialty practice for a CT scan. This advanced imaging technique took only about 20 minutes, and was able to clearly delineate an area of infection underneath one of his upper molars. Usually dental issues can be pinpointed with regular radiographs, but in this case diagnosis proved extra challenging. 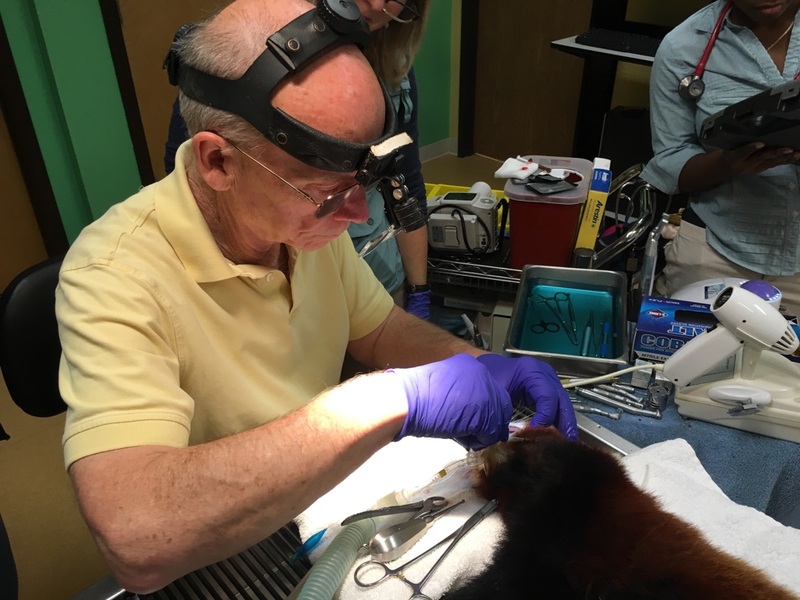 We made arrangements to transport the red panda to a board certified veterinary dentist, Dr. Ben Colmery at Dixboro Veterinary Dental and Medical Center in Ann Arbor. Dr. Colmery was able to remove the problem tooth, which allowed the infection to drain clear of the area. Within days, the red panda was opening his mouth wide to eat all of his food items and seemed much more comfortable. 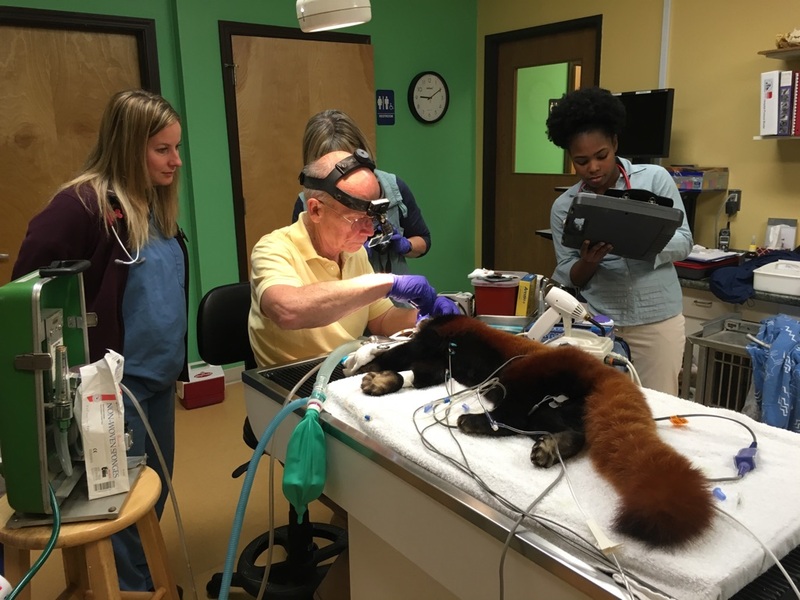 Every member of the Zoo’s veterinary staff helped during one or more of the red panda’s examinations and treatment. This case demonstrates how teamwork, persistence, and assistance from outside experts can lead to a great outcome for our treasured animal patients. I’m thankful for the assistance that we receive from our veterinary colleagues, and proud of the great work that we do in the Ruth Roby Glancy Animal Health Complex!